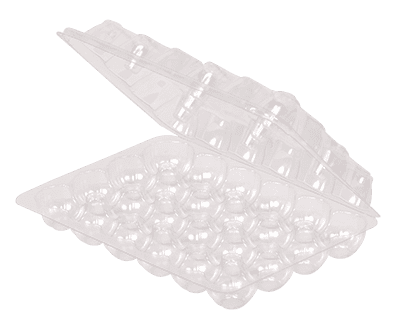 Plastic Quail Egg Cartons | Drader Manufacturing Industries, Ltd.
Our thermoformed quail-egg cartons are reliable, recyclable, consistent products at a fair price. Drader’s manufacturing capability for the Agriculture and Horticulture industry is vast. Our Injection Molding and Thermoforming and Vacuum Forming create reliable, recyclable Quail-egg cartons in all quantities. Cartons are usually shipped in boxes of 350, but other quantities can be made available upon request. Our Quail-egg carton holds 24 eggs, has a flat face for labels and three flat areas for staples across the front.